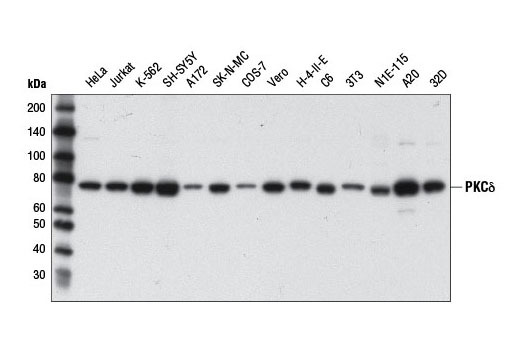 Western blot analysis of extracts from various cell lines using PKCδ (D10E2) Rabbit mAb. 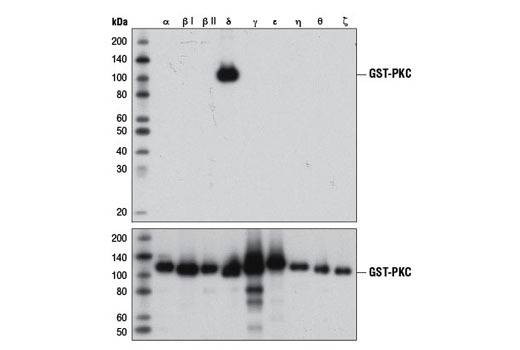 Western blot analysis of bacterially expressed, GST-tagged, purified PKC isoforms, using PKCδ (D10E2) Rabbit mAb (upper) or GST (91G1) Rabbit mAb #2625 (lower), demonstrating specificity for PKCδ. PKCδ (D10E2) Rabbit mAb recognizes endogenous levels of total PKCδ protein. This antibody does not cross-react with other PKC isoforms. Monoclonal antibody is produced by immunizing animals with a synthetic peptide corresponding to residues surrounding Arg216 of human PKCδ protein. PKCδ is classified among the calcium-independent, diacylglycerol-activated "novel" members of the PKC superfamily, which includes PKCδ, ε, η, and θ. Unlike other PKC family members, whose activation appears to contribute to tumorigenesis, PKCδ appears to function as a tumor suppresor as down-regulation of this enzyme is associated with tumor progression (8). Like other conventional and novel PKCs, PKCδ is potently activated by diacylglycerol and phorbol ester and its kinase activity is modulated by phosphorylation within the conserved activation loop (Thr505) as well as the autophosphorylation site (Ser645) and hydrophobic, carboxy-terminal residue (Ser664) (9-11). Interestingly, PKCδ funtionality is uniquely regulated by phosphorylation at tyrosine residues by receptor tyrosine kinases, members of the Src kinase family, and c-Abl (9,12-14). For more information regarding PKCδ phosphorylation sites, please see PhosphoSitePlus® (www.phosphosite.org). Lu, Z. et al. (1997) Mol Cell Biol 17, 3418-28. Benes, C. and Soltoff, S.P. (2001) Am J Physiol Cell Physiol 280, C1498-510. Li, W. et al. (1997) J Biol Chem 272, 24550-5. Le Good, J.A. et al. (1998) Science 281, 2042-5. Morita, M. et al. (2008) J Biochem 143, 31-8. Denning, M.F. et al. (1996) J Biol Chem 271, 5325-31. Kronfeld, I. et al. (2000) J Biol Chem 275, 35491-8.